Stephen Steinbrink knows that a utopia is unattainable, and he's okay with that. But imagining or desiring it is acceptable, a concept the Oakland-based singer-songwriter wrestles with on his latest, Utopia Teased. An emotional response to the Ghost Ship fire of 2016, a DIY creative space that emerged as a safe haven for both artists and musicians, Steinbrink realized that the only way he was going to squander that anger and grief was to get back into his writing routine. The result of this process eventually led to the completion of Utopia, which sheds the production clarity of his last effort, Anagrams, with a homespun sensibility. The dawdling acoustic rock that shaped his past records - from the breezy, seventies-inspired AM pop of Arranged Waves to the beefier power-pop of Anagrams - now rings with a more jagged appearance. But the one defining element that remains consistent is his knack for melancholy ballads with a darker undercurrent. From the descending guitar riffs of Empty Vessel to the winding, Paul McCartney-esque Mom, Steinbrink reflects on the small choices we take on an everyday basis to counter our moments of sorrow. Steinbrink is always hellbent on finding the beauty at the core of his compositions. And Utopia features some of his best yet - there's the sun cast jangle of Maximum Sunlight, which perfectly captures the languor of suburban life with a picturesque lens. Whereas on Zappa Dream, he expands upon the existential rumination of his friend Rosie Steffy's original and turns it into a mini prog-pop suite. Even when the songs are at their most pleasant, it's as if he needed to give them a slightly unhinged bearing so they'd feel more tactile. 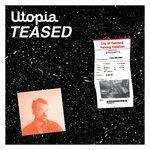 Utopia Teased is a more relaxed, laidback affair for Steinbrink, and that's something to say considering his tuneful compositions tend to follow a mellow, well-paved path. Some of his warped guitar dynamics grow a bit repetitive, and his use of synths can sometimes either benefit or hinder his ideas, but he still manages to balance many different moods with comforting reassurances. His mercurial lyrical insights look at loss as a natural process, and how accepting its inevitable outcomes creates a temporary utopia in all of us. And sometimes, that's as much as we need to be able to move forward.